What would you say with regards to a TAV whose left foot is long as in the example of LATET in the above scan. 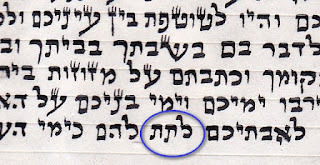 Would you say that the letter still retains it's shape and therefore is still KASHER. Or would you say that it has changed it's shape resembling a KUF and therefore PASSUL. Do you think this is a case of SHEELAT TINOK, or that a TINOK would be irrelevant in this case. Your insight is appreciated.